He said it was consensual. In the hushed aftermath of a total eclipse, Laura and Kit interrupt something awful. Laura is sure about what happened. Later, in a panic, she tells a little white lie - and four lives are changed irreparably. When the victim turns up on their doorstep, her gratitude spills into dangerous obsession. Laura and Kit decide to run - but Beth knows they have pledged to see every eclipse together. They will never be able to entirely escape her. As the next eclipse draws near, Laura must confront the fallout from what she saw in the darkness. Confessing will cost her marriage; keeping the secret might prove fatal. But all secrets, sooner or later, will come to light. Not that I'd expect anything less from the author who has already written some amazing novels and collaborated on some of my favourite Television shows/adaptations. Usually I'm not a fan of novels being taken from their written format and transformed into television shows, but there is just something about this novel that I could foresee gripping the nation, akin to Broadchurch - which incidentally Erin Kelly knows a thing or two about. Laura Langrishe is a very young adult, still a teenager really when she stumbles across a terrifying sexual assault at an eclipse festival. Her boyfriend Kit chases after the young woman's attacker but to no avail. Kit and Laura are asked to testify as witnesses after the attacker Jamie Balcombe is bought to trial. He maintains his innocence throughout, but they all know that that is a lie. But it is Jamie's word against Beth's, a classic He Said/She Said case according to the journalists camped outside the courtroom. Decades later and Laura is terrified of Beth finding her and Kit's marital home. What changed so much after Jamie's sentencing to make Laura so petrified of the girl she saved? And is it really Beth that Laura needs to be afraid of? One thing that we can all take away from He Said/She Said is that one little white lie can quickly lead to another, and before you know it the life you thought you knew is brutally torn apart. He Said/She Said is destined to be a huge hit. It is so clever, just when you think you have it sussed, something happens that you weren't expecting and you have to start all over again. 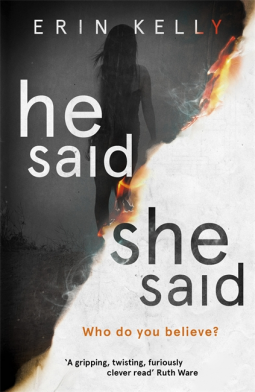 He Said/She Said is available now via Amazon online and all good book shops.